The ‘Torre Caja Madrid’ (Caja Madrid Tower) is the highest building in Spain.The skyscraper is located at the Cuatro Torres Business Area in Madrid and has a height of 250 m (820 ft) and 45 floors. The shot was taking during a session with a lot of windy and rainny transients. During one of these, to protect my gear and myself, I went to a hole near an emergency exit at the nearest building, the Eurostar Madrid Tower Hotel (Sacyr Vallehermoso Tower), and I looked up then to the ‘Caja Madrid’ skyscraper, and I saw that I had a great shot using the structure of the ‘Eurostar Madrid tower’ to frame the Caja Madrid Tower. Canon EOS 450D | Sigma 10-20mm f4-5.6 DC EX HSM @ 10 mm | f11, 1/50s, ISO 100. HDR from 3 exposures @ [-2 EV .. -0 .. +2 EV ]. The Lamborghini Murciélago is a high-performance two-door, two-seat coupé sports car produced by Italian automaker Lamborghini. Often referred to as a supercar, it is powered by a recent evolution of the Lamborghini V12 engine, and is the flagship of the automaker’s lineup. The Murciélago was introduced in 2001 for the 2002 model year as the successor to the famed Diablo supercar, and was the automaker’s first new design in eleven years, as well as the first under the ownership of German automaker VW. 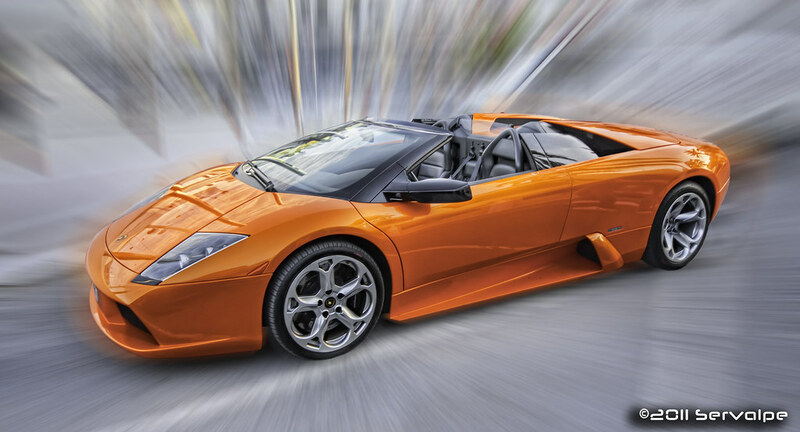 The Murciélago was styled by Peruvian-born Belgian Luc Donckerwolke, Lamborghini’s head of design from 1998 to 2005.The roadster version of the car was introduced in 2004. This picture of a roadster version with superb orange colour was taken during a Spring at Banús Harbour. This marina was surrounded by a lot of luxury cars. I think that so much of them rented. And the day that the image was taken, I had the chance to shoot different Porsche, Aston Martin and Ferrari series too. Canon EOS 450D | Sigma 10-20mm f4-5.6 DC EX HSM @ 16 mm | f5, 1/50s, ISO 100. HDR from 3 exposures @ [-2 EV .. -0 .. +2 EV ]. From the top of St. Rule’s Tower, it can be seen this admirable panorama of the St Andrews town, the sea and the surrounding countryside. This tower is located in the Cathedral grounds but predates it, and it was probably itself part of the Cathedral up to the early 12th century. The name of the tower comes from a legend that credits that St. Rule (also known as St. Regulus), brought the relics of St. Andrew to the area from their original location at Patras in Greece. It was beautifully built in grey sandstone ashlar, and immensely tall, it is a land-and sea-mark seen from many miles away. Its prominence doubtless meant to guide pilgrims to the place of the Apostle’s relics. The ruins of the St. Andrew’s Cathedral are located in the foreground. The cathedral was of the Bishops (later Archbishops) of St. Andrews from its foundation in 1158 until it fell into disuse after the Reformation. The ruins indicate the great size of the building at 350 feet (over 100 metres) long. They are surrounded by a cementery with so much tombs that can be view along the view. Near the shoreline, at the East wall, they are the ruins of the St. Andrews Castle and the West Sands beach. Panasonic DMC-FX9 | f2.8, 1/320s, ISO 80.